Powers/Abilities: Earl Duggan was a normal human with no paranormal abilities. Although having no prior training in the occult, Duggan was able to harness the mystical forces of Obeah (Afro-Caribbean shamanism) and used a voodoo doll to murder Walter Hamill. 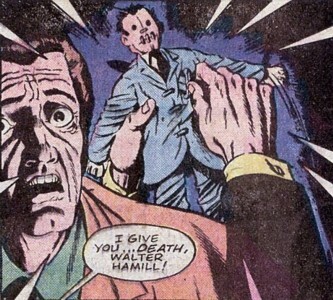 Duggan made a life-like mask of Hamill and wore it to assume Hamill's identity; later, Duggan's own face was physically altered by supernatural means to actually resemble Hamill's. (Giant-Size Chillers#1/7 (fb) - BTS) - The past of Earl Duggan is largely unrevealed, but at some point he became the confidant and right-hand man of Walter Hamill, assisting the millionaire-industrialist with his business dealings. But Duggan was covetous of Hamill's wealth, and he was secretly in love with Hamill's girlfriend Judy Bryant, so he schemed to take over Hamill's financial empire and make Judy his wife. (Giant-Size Chillers#1/7 (fb)) - Duggan accompanied Hamill on a business trip to Barbados. 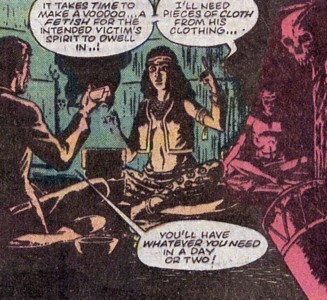 While Hamill slept, Duggan sneaked out of Hamill's residence and visited the voodoo priestess Oranna; he made arrangements with her to make a voodoo doll of Hamill. Several days later, after they returned back to America, Duggan drove Hamill to his girlfriend Judy's house; while Duggan waited outside in the car, he overheard Judy and Hamill having a heated argument. (Giant-Size Chillers#1/7 (fb) - BTS) - In a fit of jealous rage, Hamill struck Judy on the head with a fireplace poker and left her for dead. (Giant-Size Chillers#1/7 (fb)) - Coming out of Judy's house, the dour Hamill returned to the car and muttered for Duggan to drive to the airport, where the two boarded Hamill's private plane and flew back to Barbados; during the flight, Duggan noticed that Hamill only sat in sullen silence, but he thought if his plan worked out, Hamill would soon be permanently silent! The evening after their arrival on Barbados, Duggan again met with Oranna; she performed a sacrificial ceremony to the "lord of darkness" (see comments) to empower the requested voodoo doll. Afterwards, Oranna's father Yota handed Duggan the fetish and a dagger, but he cryptically warned Duggan that the spell would not stop working until the bloodthirst of the "lord of darkness" was satisfied. 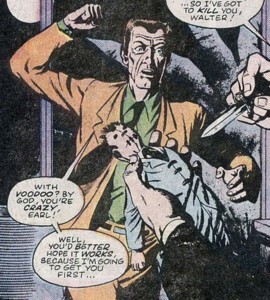 (Giant-Size Chillers#1/7) - During a confrontation with Hamill in his Barbados residence, Duggan stabbed the doll with the dagger, which killed his employer instantly. Carrying Hamill's body over to a table, Duggan next made a plaster mold of Hamill's face, then he used a flesh-like plastic to create a face mask. 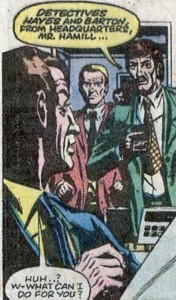 Placing the mask over his own face, Duggan adopted Hamill's hair color and hairstyle, making himself into the perfect likeness of his late employer. 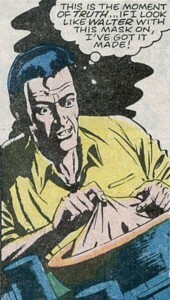 After sewing Hamill's body in a canvas sack, Duggan carried it aboard his late employer's fishing cruiser, then dumped the corpse overboard for the sharks to feed upon. Duggan returned back to America disguised as Hamill (feigning hoarseness, to explain his different voice) and he went to Hamill's office, preparing to seize control of his late employer's financial empire and make it his own. But Duggan noticed a strained air about the executive offices, for none of "his" employees would look him in the eye when they spoke to him; Duggan's suspicions were aroused: Could they have possibly seen through his disguise? 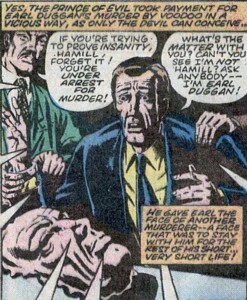 Suddenly, Duggan's whole plan exploded in his borrowed face when Detectives Hayes and Barton entered the office, and they placed "Walter Hamill" under arrest for the murder of Judy Bryant--Judy had managed to tell the detectives that (the real) Walter Hamill was responsible for striking her before she died. 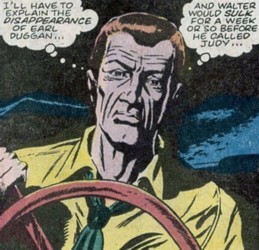 Shocked at learning the news of Judy's death, Duggan denied perpetrating the crime; he insisted that he wasn't Walter Hamill at all, but actually Earl Duggan, and to prove his claim, he tore off the mask to reveal (courtesy of the "lord of darkness")...the face of Walter Hamill! Comments: Created by Carl Wessler (writer) and Dave Gibbons (artist). 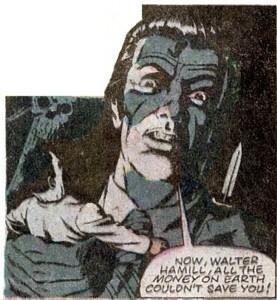 The caption in the last story-panel implied that "Walter Hamill" died shortly after being taken into custody--maybe he tried to make an escape and was shot during the attempt; it seems unlikely that "Hamill" would have been convicted and executed following a trial, since the only witness to "his" crime (Judy Bryant) was dead and unable to testify. Although the ending of this 6-page story -- The Borrowed Face! --implied that some demonic entity (e.g. Mephisto, Satannish, Satan, etc.) was the "lord of darkness" who empowered the voodoo doll and altered Duggan's face, it seems more logical that one of the Vodu gods was responsible. A millionaire industrialist and the head of a dozen corporations, he employed Earl Duggan as his assistant. But unknown to Hamill, Duggan was engaged in a scheme to assume his identity, and he had a voodoo priestess make a doll of Hamill. Hamill's girlfriend was Judy Bryant, but he was insanely suspicious that she was cheating on him with another man. When they returned back to America following a trip to Barbados, Hamill had Duggan drive him to Judy's home; while inside, Hamill smelled cigar smoke and accused Judy of seeing another man, but Judy explained that the plumber had just left, and he had been smoking a cigar. Nevertheless, the two got into a heated argument; Hamill grabbed a fireplace poker and struck Judy on the head, leaving her for dead. Hamill immediately went back outside and had Duggan drive to the airport, where the two boarded Hamill's private jet and flew back to Barbados. 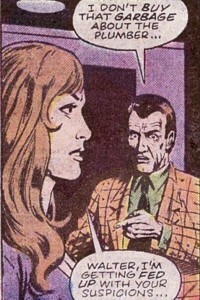 Hamill was later killed when Duggan stabbed the fetish with a dagger. After Duggan made a mask of Hamill and assumed his identity, he threw Hamill's body into the ocean, where it was devoured by sharks. She was the girlfriend of Walter Hamill, but Earl Duggan was secretly in love with her (It was unrevealed if Judy reciprocated Duggan's feelings for her). When Hamill returned from Barbados, he stopped by Judy's house and smelled cigar smoke; Hamill accused Judy of cheating on him with another man, but she explained that the plumber had just left, and he had been smoking a cigar. Regardless, Hamill flew into a jealous rage, grabbed a fireplace poker, and struck Judy on the head. Judy was left stunned by the attack, and although her injury would eventually be fatal, she managed to tell Detectives Hayes and Barton that Hamill had struck her before she died. A voodoo priestess on Barbados, Earl Duggan, requested that she make a voodoo doll of Walter Hamill so that he might use it to kill Hamill. Oranna told Duggan to bring her pieces of cloth from Hamill's clothing so that she could construct the doll. 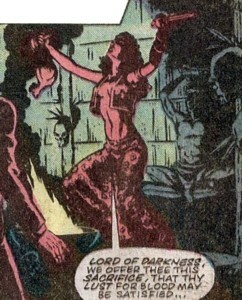 Later, Oranna performed a sacrificial ceremony to the "lord of darkness" (see comments) to empower the fetish; following the ceremony, Oranna sunk down exhausted, and her father Yota offered the voodoo doll to Duggan. The father of voodoo priestess Oranna, he handed Earl Duggan the dagger and voodoo doll that Duggan would use to magically kill Walter Hamill after Oranna had empowered the objects. 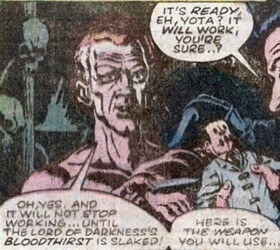 Yota warned Duggan that the voodoo spell would not stop working until the bloodthirst of the "lord of darkness" (see comments) was satisfied. Two police detectives (It was not specified which was which, nor what department they worked for), they had earlier investigated the murder of Judy Bryant--Judy managed to tell them that Walter Hamill had struck her on the head with a fireplace poker before she died. 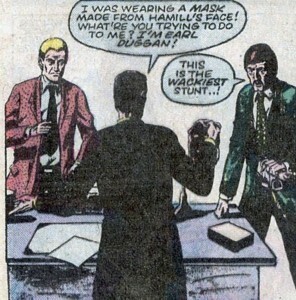 The detectives later went to the office of Walter Hamill to arrest him, but "Hamill" (actually Earl Duggan wearing a face mask) denied he was the culprit, and claimed he was actually Earl Duggan. When they saw "Walter Hamill" tear off a face mask to reveal his own face, they thought the millionaire industrialist was merely pulling a wacky stunt to feign insanity, and they took him into custody.